My friend, Natasha, of 5 Star Foodie Culinary Adventures, is hosting an event where she has asked us to further explore the flavours and textures of Macaroni and Cheese by deconstructing it and adapting it to our own culinary style. You still have time by the end of the month to prepare your own version of Mac N Cheese and send it over to Natasha. 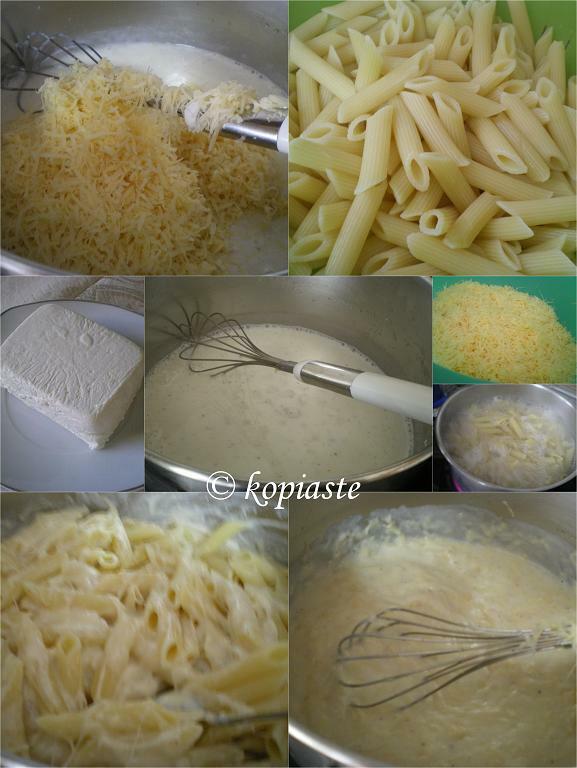 Makaroni and cheese is a dish, I believe, everybody loves, especially the children. My mother always used to boil a chicken so that she could cook the pasta in the broth, which makes it very tasty. Then we would eat the pasta with lots of anari (called myzithra in Greece) or grated halloumi on top. A very rich and flavourful dish, pure comfort food at its best. Every now and then, I get a craving for some good, baked macaroni and cheese and although I have stopped cooking pasta in chicken broth, as I used to until recently, I still want the dish to be creamy and crusty, soothing, filling and satisfying but still trying to keep it as healthy as possible. Although as I said macaroni and cheese is a rich dish, it is also a flexible dish that can be customized to regional products and cheeses and satisfy unique culinary tastes. It can also incorporate other products like seasonal vegetables, meat etc., and be cooked in the oven or the stove top. I have quite a lot of pasta dishes in my file of recipes to post but I have chosen only a few for today’s post. The first recipe is an old one which is a quite rich dish. In this dish, I have used graviera and smoked turkey and lountza. Loutza is a traditional product from Cyprus with unique taste, made of pork tenderloin, which after being brined and marinated in wine and coriander seeds, it is smoked. Other times when I didn’t have lounza, I added some pasto and sausages, giving it a completely different taste. Boil pasta al dente according to package instructions. Drain and place in a baking tin and mix in the smoked meat and the cheese. Whisk the eggs and add the milk and yoghurt. Season with salt and pepper and pour over the pasta. Sprinkle additional cheese on top and baked until golden on top. However, as years pass, I am more conscious about what we are eating and I have changed my cooking habits and now try to avoid fatty products. Boil pasta al dente according to your package instructions.Drain and set aside or if you are preparing them earlier leave them in cold water. Heat the olive oil and add the flour, salt and nutmeg and prepare a roux.Add the milk and mix until it comes to a boil and mix until it thickens.Mix in 1 cup of cheese as well as anthotyro.Add the drained pasta, pepper and mix. 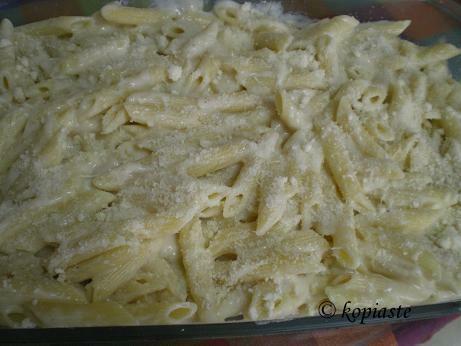 In a casserole dish sprinkle some of the remaining cheese and add the pasta.Sprinkle the remaining cheese on top with a sprinkle of nutmeg and bake in a preheated oven at 180 degrees until the cheese melts on top. 2 tablespoons kefalotyri or dried myzithra. Wash, drain and cut chicken into thin slices of 1 cm thick. Heat olive oil in sautéing pan. Sauté the chicken on both sides.Add the onion and garlic and sauté until translucent. Season with salt and pepper and then add the wine and 2/3 of anthotyro.Mix and cover the pan and simmer for about 15 minutes, until all the fluids are absorbed. Simultaneously boil pasta according to package instructions, which is about the same time.Drain pasta and mix with the chicken. Mix in kefalotyri and basil, as well as the remaining 1/3 anthotyro, cut into cubes and mix. Serve warm with some fresh cracked peppers on top. WOW! Can I come over??? Every variation looks FANTASTIC! Now, I have the urge to make a Mac n Cheese. I like your version with the Bechamel best. Ivy, this is fantastic! I love all three unique versions! My daughter is looking over my shoulder right now and demanding I make the souffle right away 🙂 Thank you so much! O wow novel … funny how something simple as macaroni and cheese can be turned interesting (international also) with everyone adding their own spin … Cooking the pasta in chicken broth is excellent idea, something new to me. I will try this, def sounds good! I am sure the Greek cheeses give all 3 versions such complex flavour. Mac and cheese is one of my favs, even though I’m not a kid anymore!!! I love the Greek-style baked mac and cheese! yum! J’adore le gratin de macaronis ! My mother used to add some lightly boiled cauliflower to the mac and cheese. The usual cheese was cheddar. I’d take any version though. I’m not fussy! If you want you can write in english, I have no problem to understand or read english, to write it’s an other problem, excuse me ! I’m ready for any of those preparations. Love mac n cheese any time. Wow, Ivy, you really unleashed your creativity for the occasion. All the dishes look great. These all look amazing! You are the mac ‘n’ cheese Queen! Such comfort and yumminess! I have never made Mac and cheese, this reeally looks so so yummy. yes I love macaronis because of the sauce !!! and if you like creme brulée come and see my automnal version !Pierre see u ! All three versions sound delicious! I’d love to have a taste of the third option with chicken and basil first, please! Three great dishes Ivy – the chicken one would be a winner for me. Looks great! I ‘ll make the xilopittes version but afraid I can’t get them here. Tagliatelle is thicker and what is lounza? lip smacking dishes, Ivy! I love mac and cheese… great recipes!